The Holy Grail for clear skin? 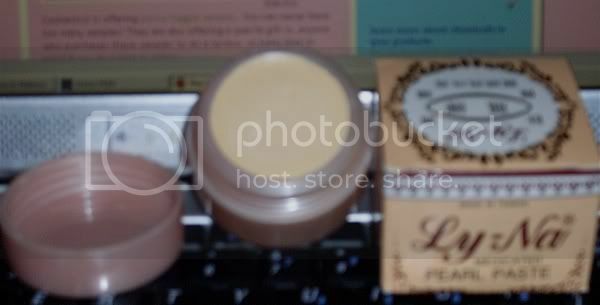 Finally got my Ly-Na Pearl Cream in from the Taiwan. I bought it off E-Bay and had forgotten about it. I have it spackled across my nose right now. It's my worst place for blackheads. It has a slight smell, which isn't that bad considering it does contain Sulfur. It is kind of perfumey and really, really greasy. Not quite so bad once it sets up on your skin. I don't see wearing it overnight, though. It would get all over the place. I'm not expecting a miracle from this stuff, but I do feel a tingle. Does that count? LOL. The Sulfur ingredient is a standard ingredient for prescription acne medication and has been used forever in skin remedies. I have read that pearl powder provides moisture along with being a skin lightener. The container is much larger than the actual product inside. The box states 12 grams of product. The ingredients on the box are listed as Sulfur 1.5% and Pearl Powder .1%. No mention of Parabens. I can't guarantee it's Paraben Free, but I can't find it listed anywhere. Read my previous entry for more details and a link to Vanessa's blog where she does a demo of it here. hi there! i've got a pearl cream from taiwan too (it's not ly-na though) and wondering what's the texture like? mine's really greasy, more like wax than a cream. is yours the same? could you let us know the seller you bought the ly na cream from,please, thanks.